Cheer on Jimmie Johnson as he leads the pack in 2019 in search of his 8th Championship. 100% cotton grey t-shirt features image of the brand new 2019 Ally paint scheme and sweet graphics. Very nice shirt. Love the quality and the graphics are super! The shirt is great. It is well made and very comfortable. Nice heavy T-Shirt material. I love this shirt! The colors are bright and the shirt is very comfortable. I love my shirt, good quality and I will wear it a lot. I had a good process in ordering and receiving my order. Graphics are great. Good fit. Love the #chasing8 being on it!! Love it!!!! Size fits great!! Price was right! ???? ??48?? Love the colors and the feel of this shirt! 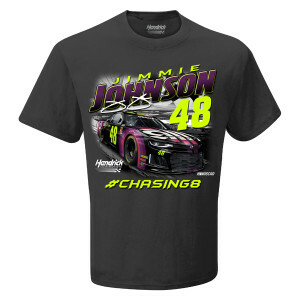 A must purchase for any Jimmie Johnson fan! Cant wait to have my first "chasing 8" t shirt.